I still love the original movie the most. Probably because it was the one I grew up with. 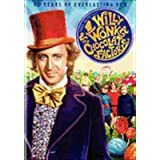 Right now, Amazon is selling Willy Wonka & Chocolate Factory for only $5! This would make a great stocking stuffer!